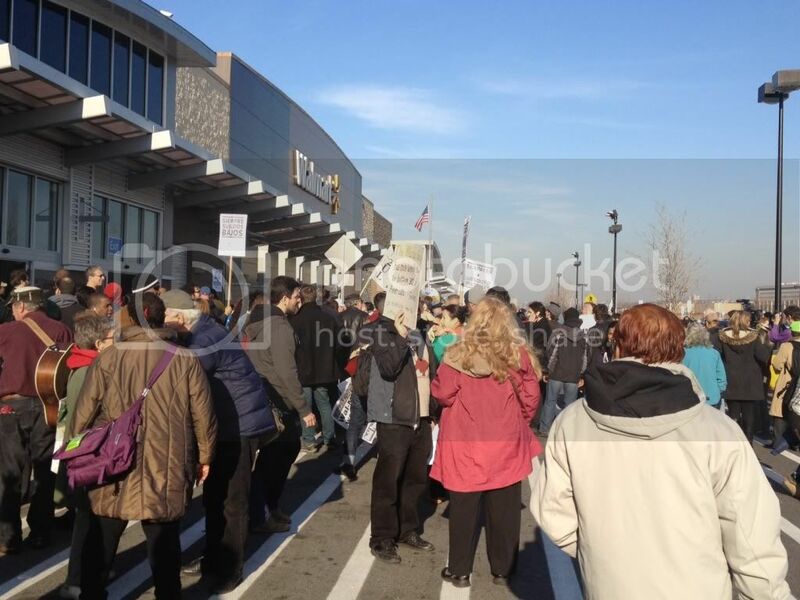 A coalition of labor supporters protested alongside striking employees to speak out against Walmart's intimidation and abuse. A coalition, including Occupy Wall Street, 99 Pickets, ALIGN, Rev. Billy and the Church of Stop Shopping, and the Retail Action Project gathered in Secaucus, New Jersey today as part of nationwide protests against Walmart and in solidarity with the company’s employees, who have reported widespread abuse and intimidation. 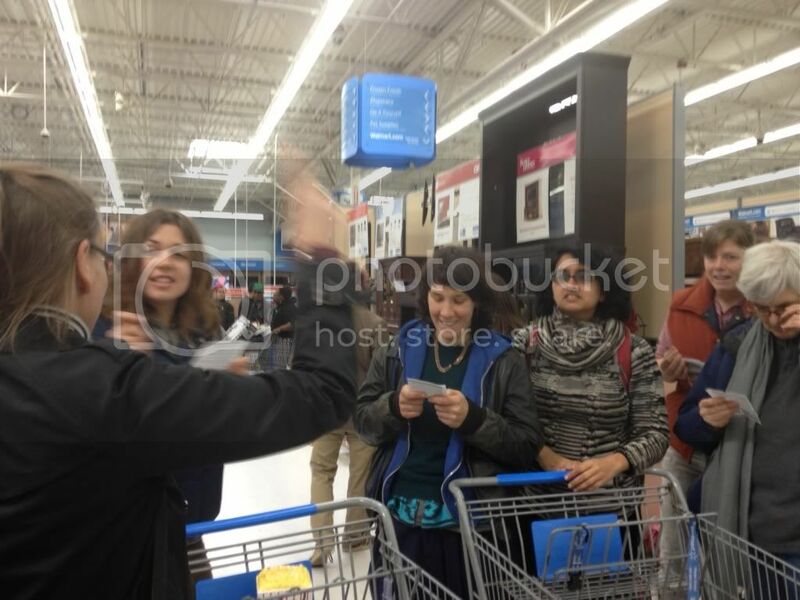 While some brave Walmart employees joined protests in other locations (a Chicago Walmart worker who walked off the job declared, “My ends ain’t meeting) and others expressed reticence to join the protests (a California employee said her co-workers wouldn’t strike because “they think we’ll never win” and “they didn’t want to lose their jobs”), the protest in Secaucus was more about offering solidarity and basically mirrored Occupy’s system of jail support. In short: Occupy wants to provide support for people risking a lot to fight for their rights. Sometimes, that means offering jail support to activists willing to get arrested. Today, it took the form of performing a mic check inside a Walmart and then conducting a protest outside to show Walmart employees, perhaps some of whom are intimidated by the union-busting practices of the corporation, that they’re not alone. We at the Occupy Solidarity Network would like to help alleviate that worry for anyone who is fired in retribution for organizing or demonstrating at Walmart. Walmart workers decided in October 2012 to strike on Black Friday after they were targeted for retaliation for speaking out against substandard work conditions and treatment in the first ever walk out in the history of the company. Now we are looking at a world in which the bravest workers of Walmart are being fired so they may be silenced. OWS also provides links to support the Walmart organizers and to donate to the Walmart Workers Food Fund. Before the action in Secaucus, organizers stressed that today was not about creating even more misery for Walmart workers who are already asked to work brutally long hours during the Black Friday frenzy. They reminded protesters to be polite and courteous and to hand out fliers if asked about why they’re protesting Walmart. Security at stores was excessive, even taking into consideration the sometimes chaotic scenes associated with Black Friday sales. 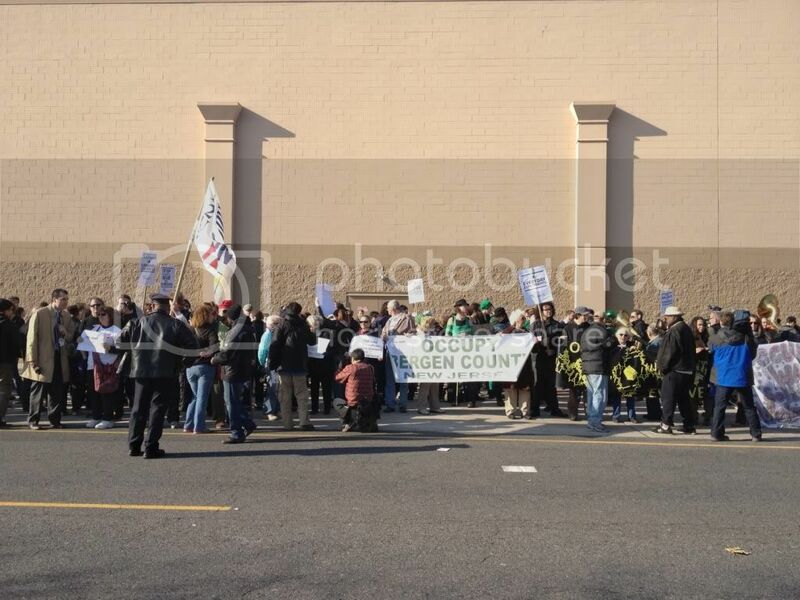 After the morning crowd surge had come and gone, a weird mix of local police, state police and officers from the Sheriff’s department still patrolled the aisles of a Walmart in Kearny, New Jersey, occasionally communicating with store management about the presence of pesky protesters. Walmart was definitely the largest private recipient of taxpayer-funded policing today. What do the historic Walmart strikes mean for labor organizing? Check out Josh Eidelson's coverage here.